“Battle Wounds” – Uploaded by Binary Blonde on 8th November, 2005. I meant to send this last night, but I was too exhausted. 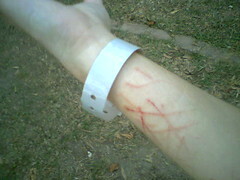 The photo is my arm decorated by a semi-feral kitten which needs to be force fed twice daily. The grey band is what security puts on you to “clear” you for being in the Superdome. My last “full” day was today. I am so sad about leaving. I hope to return late in the year. Anyway, because I missed sending a photo last night, stay tuned for another photo tonight.